The different grades of malleable iron are essentially the result of different heat treatments. Just as a medium carbon steel can be heat treated to a wide range in properties so can malleable iron, but malleable is even more versatile. The combined carbon content, on which heat treatment depends, can be adjusted from none, as when the microstructure is entirely ferritic, to that of a fully pearlitic structure. Malleable iron is characterized by containing graphite in an aggregated or nodular shapes. This form of graphite is called temper carbon because it is formed during heat treatment. Malleable iron is cast as white iron in which all of the contained carbon is in the combined form as iron carbide. After casting, the hard iron castings are annealed by holding them at a temperature in the 1500- 1780F (800- 970C) range. At this temperature, the iron carbide dissociates into graphite and austenite, and the graphite collects in nodules. Subsequent cooling at a controlled rate allows the austenite to transform into ferrite and additional graphite. This heat treating procedure produces regular malleable iron with a microstructure of graphite in an entirely ferritic matrix. More rapid cooling through the critical temperature range, or the presence of certain alloys, causes the austenite to transform into pearlite, bainite or martensite, producing the higher strength, pearlitic malleable irons. The properties of iron are the collective result of its microconstituents. The amount and compactness of the graphite exerts some effect on tensile properties. More graphite or a less compact form tends to decrease the strength. The number of graphite nodules is also a minor factor. A higher nodule count may slightly decrease the tensile and yield strengths as well as the ductility. In contrast, the matrix structure has a dominant influence on properties. A ferritic matrix provides the maximum ductility with moderate strength. Pearlite is a harder and stronger but machinable microconstituent. Increasing amounts of pearlite in the matrix increases the hardness and strength of the iron. The intermediate strength grades of malleable are normalized (air quenched) and tempered to have a pearlitic matrix. The high strength grades are liquid quenched and tempered martensite. Bainitic structures are produced by quenching into molten salt for special applications. All of the malleable iron produced in North America and mostly throughout the world is of the blackheart type. The older, European whiteheart malleable is also cast as white iron, but is essentially decarburized throughout in an extended heat treatment. Malleable iron castings must solidify without the formation of graphite, but graphite must be readily formed during the annealing heat treatment. These metallurgical requirements limit the range in chemical composition of iron that can be successfully employed and restrict the use of alloys in malleable iron. As with other types of cast iron, the carbon and silicon contents are of primary importance. 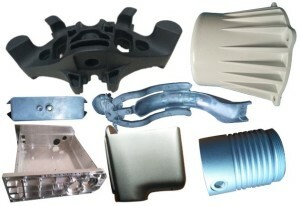 They are controlled to meet both the requirements of the casting and the process. The typical range in composition of malleable iron is given in Table 8. Iron with higher carbon and silicon contents can be used for thinner sectioned die castings that solidify more rapidly. The increased fluidity of this iron facilitates pouring thinner sections. Heavier section castings require lower carbon and silicon contents to avoid graphite formation during solidification. Small quantities of bismuth and tellurium may be added to the iron to assist in avoiding mottle, the formation of graphite in white iron during solidification. Small additions of boron and/or aluminum die casting may be added to the molten iron to increase the number of graphite nodules that are formed on annealing. This shortens the heat treating time by reducing the distance the carbon must diffuse through the iron to deposit as graphite. The presence of the proper amount of these elements assists in processing the malleable without any deleterious effect on its properties. Elements that have an opposing effect, such as antimony, tin, and chromium, are not usually employed in malleable iron. The manganese content and the ratio of manganese to sulfur contents must also be closely controlled to facilitate annealing. The manganese content may be increased to produce pearlitic malleable. Copper, nickel and/or molybdenum may be added to obtain a higher strength or to increase wear and corrosion resistance. All malleable iron is heat treated so the effect of the casting section thickness on its properties is minimized. Minimum casting thickness is only limited by the ability to fill the mold with molten iron and the maximum casting section is limited to that which will avoid mottle. Castings that are one inch thick are not unusual and sections of over two inches in thickness have been successfully cast using a special technique. The ductility of ferritic malleable decreases somewhat with increasing section, and alloy additions may be necessary to produce higher strength irons in heavier sections. The hardness of malleable iron relates quite well to its other properties so that the metal in castings can be dependably specified by hardness and microstructure. The Society of Automotive Engineers Specification, SAE J158a, designates the various grades of malleable iron by the Brinell hardness at a selected location on the casting. ASTM Specification A-602 is essentially the same. These specifications also require that the microstructure be normal, but they do not stipulate mechanical properties or composition. The various SAE grades are listed in Table 9. The hardness of fully ferritic malleable is influenced by its total carbon and silicon contents. Low silicon, pack annealed iron may have a hardness as low as 110 Bhn. Only Brinell hardness is stipulated in standard specifications. The Rockwell hardness test may be suitable for testing small castings or thin sections, but each application for inspection should be by mutual agreement. Malleable can be specified by its tensile properties in separately cast test bars or by hardness of the Aluminum casting (see above), but both should not be specified unless the relation between the test bar properties and the specific casting hardness have been established. ASTM Specification A-47-77 is for ferritic malleable iron and requires a minimum of 32,000 psi (220 MPa) yield strength, 50,000 psi (345 MPa) tensile strength, and 10% elongation in two inches (50 mm) for grade 32510. This specification also lists a grade 35018, but this is no longer in common production. ASTM Specification A-220-76 is for pearlitic malleable iron and provides eight grades of increasing strength and decreasing ductility, Table 10. The tensile properties of malleable iron are deter mined with a 0.625″ (16 mm) diameter cast-to-size test bar. Machining these test bars prior to testing has only a slight effect on the properties. Malleable iron with a bainitic matrix microstructure is very successfully used for special applications such as high strength chain. This structure is obtained by hot quenching the castings into molten salt. The modulus of elasticity generally decreases with an increasing amount of graphite and less compact graphite nodule shape. The matrix structure has little influence except in the case of pearlitic irons in which the amount of graphite is reduced, thereby improving the modulus. The modulus of elasticity may also be accurately measured dynamically in an Elastomat or in bending. Since failure of malleable iron in compression is infrequent and only after high strains have occurred, this property is seldom determined. The specific damping capacities of various malleable irons are usually measured in a range from 2- 7%, when determined in torsion. The higher damping capacity of ferritic malleable irons compared to pearlitic grades occurs because of the greater energy losses at the graphite nodules in the softer matrix. Damping capacity as the logarithm of the decay in vibration, the modulus of elasticity in tension and in shear, and Poisson’s ratio can be measured dynamically using the natural resonant frequency. Quenching malleable iron produces high internal stresses that can double the damping capacity. This increase is gradually reduced as the tempering temperature is increased and the residual stresses relieved. The specific conditions under which stresses are applied exert a significant effect on fatigue properties both in testing and in service. For this reason the stress mode and the type of specimen, such as axial loading in tension and compression, torsional loading, reverse bending of a flat specimen, or the rotating beam test, have to be considered in applying fatigue data. The endurance limits for malleable irons increase with increases in hardness and strength but the resistance to fatigue does not increase as rapidly as tensile strength with increasing hardness. Thus the endurance ratio decreases with increasing tensile strength from a value of above 0.5 for ferritic malleable, about 0.4 for the higher strength pearlitic grades, and as low as 0.3 for irons near their maximum hardness. Inducing compressive stresses into the surface by rolling, coining, or shot peening can increase the fatigue life of a component significantly. Of course, design with adequate sections that are well blended to reduce stress concentrations is most effective in reducing the possibility of a fatigue failure.